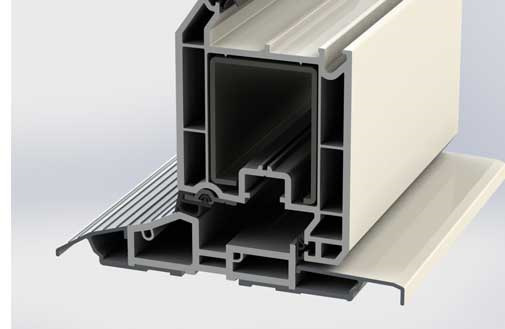 As a part of its drive to continuously improve its systems, Eurocell – the UK’s leading manufacturer, distributor and recycler of PVC-U window, door, conservatory and roofline products – has introduced a new PVC-U low threshold for its Eurologik 70mm chamfered and ovolo doors that offers users an alternative to aluminium that will cut energy bills and improve comfort. This threshold is superior to aluminium equivalents because it reduces cold bridging and is more thermally efficient. Using the PVC-U low threshold improves the U-value by roughly 0.1 W/m2k depending on the style and specification of the door. Put another way, using the PVC-U threshold can boost the energy rating of a door by up to one energy band, over the aluminium equivalent. This threshold has another advantage too: Eurocell has designed it so that it can be removed and replaced without removing the whole door if damaged. Fully tested to BS 6375 and PAS 24 both on residential and French doors, the threshold complies with Part M of the Building Regulations (Access to and use of Buildings), which govern disabled access, when installed complete with a choice of specific ramps from the company.